Should You Use a Swing Speed Radar? Advances in technology have made available to consumers products that simply were too expensive previously. 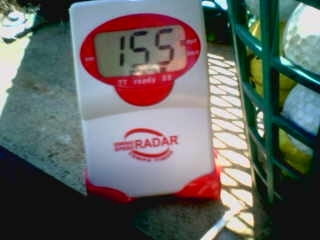 A swing speed radar is one such example. You can now, for a relatively affordable price, purchase your own personal device that will measure your swing speed and relay that information to you. For golfers who like to measure their swing and try to improve those speed measurements over time, using a swing speed radar is certainly an interesting idea. But is it a good idea? Does using a swing speed radar to track your swing over time really tell you that much about your game and how to improve? Ultimately, that answer is up to you – but, there is no doubt that it can be a useful tool when employed properly. There is a big correlation between club head speed and handicap, so if you want to become a better player, then you will have the need for speed. When you starting thinking about using a swing speed radar during your practice sessions, it is important to remember that club head speed is not the only thing that matters in a golf swing. Making solid impact in the center of the club face, with the club coming in on a good path and face-to-path relationship, is also just as important as the club head speed numbers. This is where the danger of using swing speed radar comes into play. It is tempting to fall in love with the radar and become obsessed with simply ‘impressing’ it as you try to faster and faster. This is a potentially destructive habit for your golf game. It is a good goal to want to improve swing speed over time (and this can indeed be done with one of our swing speed training programs), but not at the expense of your technique or balance. If you can’t swing faster than you currently do without losing control of your mechanics, then that is where you need to be careful. There’s normally a tipping point in effort where control starts to go out the window. The exact threshold varies from person-to-person, but generally speaking it’s not a good idea to swing over 90-95% of your max. PGA Tour player David Gossett, for example, has a threshold of about 92%. If you have a radar, you can find out your own personal threshold. Where a swing speed radar can be of some further help is in showing you how improving your mechanics can add to your swing speed – even if it doesn’t feel like it. Rather than trying to simply swing as hard as you can to gain MPH’s on your swing, try getting better through improving your technique. Find parts of your swing that need work (either on your own, or with the help of a teacher), and take time to refine them. After a period of working on your swing, go back to the radar and see if your results are any better. If you have done a good job of improving the mechanics of your swing, you just might find that your swing speed has increased as a result. This is really where a swing speed radar can help your game. When you start to learn how to swing faster by getting technically better – and then you take that technique and train to physically be able to execute your good technique but also faster – you can be on your way to a much better overall golf game. So if you plan on becoming a better player, then yes, using a swing speed radar to work toward this goal is absolutely a tool worth implementing as part of your practice routine. Recommendations for a swing speed radar? What do you recommend for a swing speed radar? The one that I’m currently using is Sports Sensors Swing Speed Radar. They make blue one that only measures swing speed (baseball and golf) and they also make a red one that measures tempo and swing speed. At the time of this post, the blue one costs about 100 USD and the red one is about 150 USD. They are both easy to use (only one button), measure in mph or kmph, and are pretty reliable. There is an occasional funny reading, but it doesn’t happen too often and I guess it’s to be expected with any device.